Ireland outranks the United States in the most recent World Happiness Report. 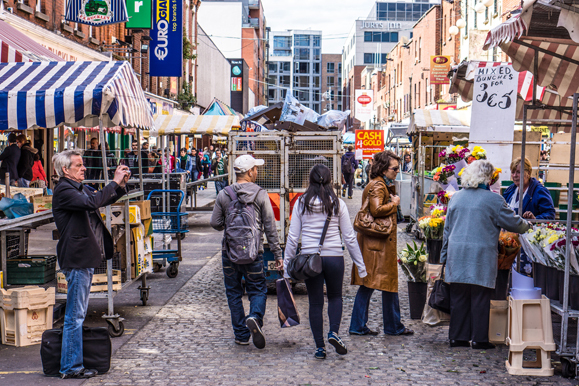 Pictured: Dublin's Moore Street market. According to the 2018 World Happiness Report published in March, Ireland has outstripped the United States by four rankings in terms of national glee, coming in as the 14th happiest country. The list, which analyzed statistics from 156 countries, is compiled annually and is based on residents’ perception of their nation’s performance in six areas: average income per capita, levels of generosity to others, length of life expectancy, availability of institutions of social support, individual freedoms, and reports of corruption. The drop in ranking by the U.S., which had previously been 14th itself, is understood to be in reaction to the unequalled national rise in obesity, opioid addiction, and depression in recent years. Ireland, however, has moved up one spot since 2017’s report, an improvement accorded to the reevaluation of the national life expectancy (an additional 4.1 years, increasing the average estimation from 67.4 to 71.5), as well as the value Irish respondents place on the social aid programs in place for individuals who need them. This article relates very much to me as an emigrant of Ireland who became a U.S. citizen after honorably serving 4 years in the marines as a legal immigrant. The last paragraph tells us that Ireland [the independent Irish state\ is more tolerant of immigrants that the U.S. My own experience is that WASPS, including my wife’s people, for the most part have been more accepting od me that have Irish-American Catholics, including a few of my own first cousins.